This has become the predictable reaction when Jay White takes out his tour books and reveals his double-life to new teammates. He’s never offended by it. He gets it. After all, there’s no standard protocol for when a player discovers his backup goaltender for the night is Neil Diamond. “They’re surprised when they find it out," said White. Jay White has been playing goal since he was eight years old, growing up in Ontario before moving to Detroit. His dream was to make it to the NHL one day; the farthest he took his hockey career was a pair of preseason games with the IHL Kalamazoo Wings. When he’s not belting out “Craklin’ Rose” at a 'Legends' show, White has been an on-call emergency goaltender in Las Vegas for roughly 20 years. If the local team – be it the now-defunct IHL Thunder or the ECHL’s Wranglers, Sin City’s current minor league hockey franchise – was down a goalie, they’d call White to fill in. “If one of their goalies gets sick or hurt or called up or called down, and they get stuck with one goalie, they’ll call me in. I’ll practice for a couple of days and then maybe dress for a game,” he said. This used to be easier for White, back in his youth. That’s the irony: The older one gets as a goalie, the tougher it is to perform; the older one gets as Neil Diamond, the more one fits the part. He’s now 58 years old with three children, hitting the gym three times a week and the ice twice in order to remain in playing shape. Last summer, he hit the rink with Wranglers players, Deryk Engelland of the Pittsburgh Penguins and Jason Zucker of the Minnesota Wild to practice for the upcoming season, so White could be ready if his services were needed. On Sunday, he got the emergency call again. Only it wasn’t from the home team. The Florida Everblades visited the Wranglers on Tuesday night, a rematch of the 2012 ECHL Kelly Cup finalists. Like every minor league team, the Everblades faced some sudden roster adversity when goalie Kristers Gudlevskis was called up by the Syracuse Crunch of the AHL for the next week or so. They needed a goalie to back up Jesse Deckert temporarily. Jay White answered the call. Even if it meant potentially facing the Wranglers as an opponent. “I was torn on who to root for tonight. I’m sitting on the bench for one team that’s playing the team from my hometown!” he said. White went to Everblades practice on Monday, skating with the enemy. He strapped on his pads, lowered his mask and went through the usual routines to keep himself and his temporary teammates sharp. “I’m over 50. All these guys are under 30. It’s kind of an unusual thing," he said. About that mask: It’s billboard for White’s twin passions. On one side is Neil Diamond striking an iconic pose from “The Jazz Singer”. On the other side, a few Vegas hotels in which White has performed. On the front the words “VEGAS DIAMOND” below a Maple Leaf with a Statue of Liberty head inside of it, representing his dual citizenship. “A Neil Diamond guy who also plays goalie,” he said. White was told about his uncanny resemblance, vocally and physically, to Diamond in his mid-20s. His first gig recreating Diamond was at Diamond at Mr. F's Supper Club near Detroit in 1982, where he worked for about five years before “Legends in Concert” producer John Stuart asked him to audition for their Vegas show. He played 50 weeks a year at the Imperial Palace for almost nine years, where he became Legend's longest running act in one venue. This led to tours around the world, and also some lucrative corporate gigs as well. White carries around books with images from his performances as Diamond, but he also has pages dedicated to his hockey passions. “My prized possession is a picture as a 9 year old with Terry Sawchuk,” he said, name-checking the Hall of Fame goalie. His pro hockey career ended after failing to latch on with Kalamazoo in the IHL – “not quite good enough to be selected by team” – but he’s been able to get a taste of NHL action through participation in various alumni games over the years. He’s shared the ice with the likes of Doug Gilmour. He once stopped Rick Vaive on a penalty shot in a game in Hamilton, to the delight of old friends in the crowd who came from Kitchener. His connection with Las Vegas hockey was through his singing. Back in the early 1990s, White would perform the national anthem at Las Vegas Thunder games. He struck up a rapport with coach Chris McSorley, Marty’s brother, and eventually dropped the hint that he was a goalie willing to help the team out in any way. To his surprise, McSorley took him up on the offer months later, asking if he could be an emergency backup for the Thunder. “He probably figured the only way to find out if he can play is to put him on the ice,” White recalled the coach’s thinking. 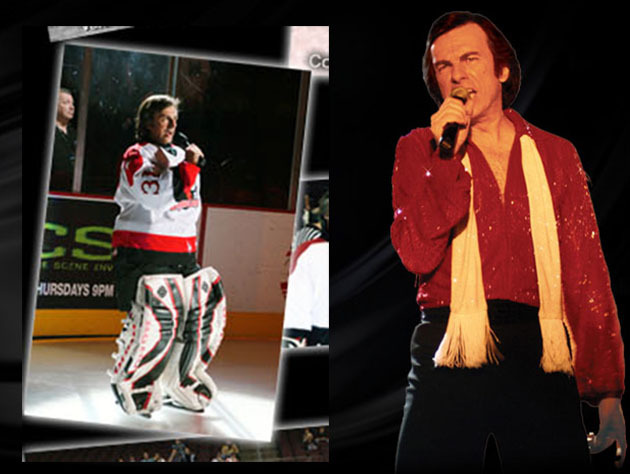 Thus began his surreal life as a full-time Neil Diamond and a part-time minor league hockey goaltender. Like the times he would work with Curtis Joseph when CuJo was playing in Vegas during a contract dispute with the Edmonton Oilers. Or beating Bill Ranford in an alumni game. Or when he’d get The Call from coach Glen Gulutzan during his six years as Wranglers coach, before he’d made the NHL behind the Dallas Stars' bench. Singing “Song Sung Blue” one night; stopping pucks the next morning. And, occasionally, waiting to see if the Thunder or Wranglers would have an emergency during the game, sending him into the net. Like any backup, it puts White in that strange spot of subtly hoping for an injury to a teammate. “You kinda are. Maybe a hurt finger or something that takes him out of the game for a while so I can go in,” he said. “On one hand I’d love to do that, one the other hand I’d probably [crap] a brick if I got in. Because this is real. It’s not practice any more." This will be the last goalie gig for a bit for White. He’s leaving Las Vegas for a Legends show that will be running in Myrtle Beach, SC, for a few months. But on January 1, it’s back to hockey, as a fan: He’s got a Winter Classic ticket, checking out his two favorite teams in Ann Arbor. Yes, he’s a Toronto Maple Leafs AND a Detroit Red Wings fan. Which would be the strangest dichotomy of Jay White’s life were he not a Neil Diamond impersonator and an emergency minor league goalie. “I was almost good enough but not quite good enough [as a goalie],” he said. As a wise man once sang: "Good times never seemed so good."